A quick glance on a snake-like fish wriggling at the bottom of the aquarium will immediately relate our thoughts to “Eels” as they are the only fish known to exist with the shape of elongated body. But however, little do we realize that there are actually various types of species belonging to different fish family in existence and the article here is meant to share the information and find out about this extraordinary creature. Eels belong to a large, diverse group of fishes classified under the order Anguilliformes. There are few hundreds species among the same family, some of which survives in freshwater and brackish water conditions while there are others which are saltwater. Because of their diversity, identifying and discussing each and every one of them is almost impossible and basically to make it short, there are those which are considered normal true eels but there are also some which are not eels at all although they actually look almost the same. For our discussion here, we will exclude kuhli loaches as they are not related or part of the eel family at all. Perhaps some of the most popular which are commonly heard that arouses the interest of aquarist are the American Eel and Moray eel which we shall go into details here. This is one of the most fascinating creature in terms of its breeding behavior and they are popular among anglers as these eels are often caught and consumed as delicacies at dinner tables. The fish show some interesting life cycle as the adult eels undergo different stages and observe changes in its physical appearance from a glass like transparent eel to become a yellow adult fish. The sexually mature eels which can be found living in brackish swamps up to freshwater streams and rivers will travel to deep sea and ocean in order to spawn and produce young fry. After spawning, the parents will die at the sea and for the young eels, once they reach a certain maturity age, they will again migrate from the deep sea where they were born, to return to the places from where their parents originate. Some of the American eels are also kept in home aquariums as pets. With its ability to grow up to 5 feet in length, one should never take things for granted and confine them to a small tank. The minimum aquarium capacity to keep the fish that size should be at least 100 gallons and above and anything below that will subject your pets to harsh and cramp living condition. In captivity, your pets will readily accept any kind of foods from worms, feeder fish and even carnivorous pellets. They can be kept together with other larger peaceful aquarium tank mates but putting them in community tank will ended up having all the smaller fish getting eaten up. One word of caution however, try to make sure that there is no open gap present on top of your tank and it should be well covered with hood or else, these eels are known to be good jumpers. The eels are also enjoyed as exotic delicacies in Asian restaurants and widely consumed for its healing properties. As such, sometimes you can actually find them being reared in large-scale fish farms and they form part of the aquaculture industry that contribute economic value in certain countries. Moray eels are saltwater marine species which are commonly found hiding in caves made up of live rocks or reefs structure in tropical regions. Being a timid and sometimes described as odd-looking creature, they often catch unsuspecting divers unaware of their presence. Depending on species some of these eels can be quite friendly but there are some which can turn aggressive, even though they are not provoked. 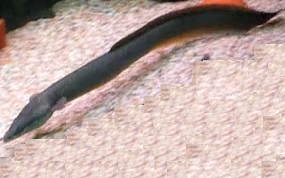 Most of them get too big to be kept in home aquariums with some reaching at least 10 feet overall, but there are also smaller specimen like the Snowflake Eels measuring only about 3 to 4 feet. Others which are also commonly known are the Dragon Moray, Zebra Moray (depicted in the above picture) and Gray Moray and attempts to keep them in home aquariums did not turn into much success and these are best left to the experts in large public aquariums. 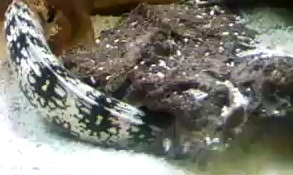 For now, the only moray eels that are successfully kept in home fish tank are snowflake eel. Being a smaller species of the generally big-sized family members, they are often described as a peaceful and responsive creature that can identify the owner who feeds them. Newly introduced snowflake often show problems related to being lethargic and will often reject foods offered to them but as time goes by they will start to adjust and acclimatize to their new environment. Make sure that you provide the right type of diet as these creatures will only accept crustaceans such as crabs, krill, shrimps and prawns. This is perhaps one of the famous fish which generates the most attention both among the circle of hobbyists and scientists alike. They are not actually true eel but rather part of the catfish family. As what the name implies, the species is actually capable of generating it own electricity coming from within its body to stun and paralyze its prey or when under condition that it feels threatened or startled. And when I say electricity, what I mean are exactly the live electricity which powers our light bulbs and homes. 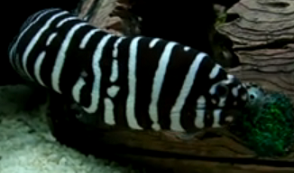 Because of its nature, this type of fish is not suitable to be kept in home fish tank, not only on the concerns on how to maintain and keep them alive but their mere presence and how you intend the handle fish will pose serious dangers both to yourself or towards anybody unsuspecting of its true capability. 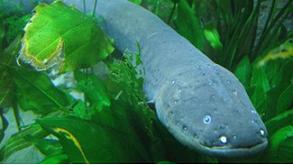 Electric eels are freshwater species and a normal, full-grown adult fish can actually attain very large size often reaching at least 5 feet in length. A word of caution though, a fish that large is enough to stun and demobilize a horse causing temporarily paralysis, thus you can imagine what the effect would be like if you are not careful and ended up being a victim. The hagfish which is a saltwater species is often considered to be an ugly fish due to its mouth region that is surrounded by pairs of barbels. Some even describe their personal experience when encountering the fish as being gross because of the amount of slime that it produces which is basically a defensive mechanism to discourage predators from eating it and then allowing it to escape from the clutches of its captors. However, certain species of the fish are still enjoyed and served as delicacies. Peacock, Tire Track and Fire eels are among the few examples belonging to this group. Again because of what they look like with their long cylindrical body, these eels-like creatures are often thought to originate from the eel family. The fire eel for example is native to the South East Asian countries in particular Vietnam and Thailand and they are known to be kept in large tanks with the presence of bigger size tank mates as their companion. They are brightly colored and their favorite foods basically comprises of crustaceans and worms.